Last Thursday, I had the honor and privilege to attend Archbishop Tutu’s Templeton Prize thanksgiving service at St. George the Martyr Cathedral. It was a beautiful and joyful service dotted with amazing music by the Cape Town Opera Voice of the Nation Ensemble. 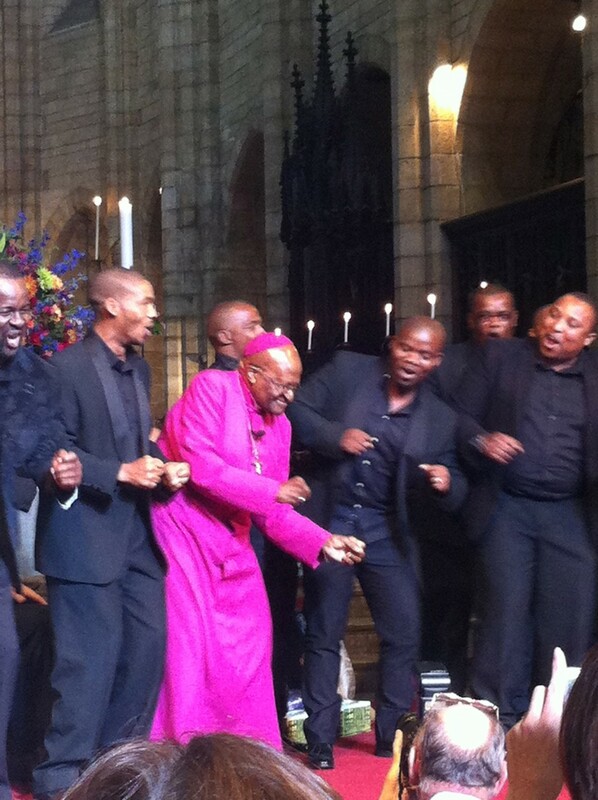 I think all of our hearts leapt when Archbishop Tutu started dancing with the ensemble. The archbishop accepted the award on behalf of the people of South Africa, saying it was the people’s award. Then he gave one of the most moving speeches I have ever heard. Speaking from the heart and walking in front of the nave of the church, Archbishop Tutu recounted parts of “the struggle” (South Africans who fought against apartheid refer to their fight as “the struggle”) as he came to the heart of his speech, imploring, “What has happened to us? What has happened to us? What has happened to us? . . . God is weeping.” Speaking of the transition to democracy, the archbishop continued, God was proud of us. He was going to show us off as a people who could live together in harmony despite our cultural differences and as a people who would share with one another what they had. “But what has happened to us?” the archbishop asked, referring to the high level of violence in South Africa, especially violence against women, and referring to South Africa’s dubious distinction of being the number one country in the world with the widest gap between rich and poor. The archbishop ended his speech by challenging all of us to reclaim the spirit of ubuntu, which to me can ultimately be summed up with Jesus’ two great commandments: Love the Lord God with all of your heart and mind, and love your neighbor as yourself. 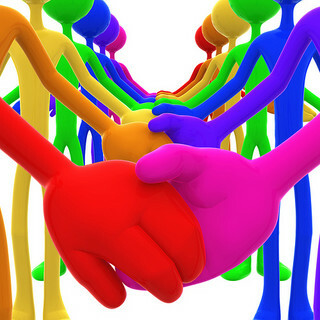 If we did this, we would be living out ubuntu. Archbishop Tutu’s words have challenged me in a profound way, and I am more determined than ever to try to live a life of ubuntu, both here in South Africa and in the States when I return home. Want you join me by accepting the archbishop’s challenge to reclaim (or claim for the first time) the spirit of ubuntu? Interdependent—that is what God is teaching me to be, and it is a hard lesson to learn. For years, I have prided myself on being independent. A child of American individualism, I have taken that concept and have run with it. As an adult, I have made my own way in life. As a singleton, I have had to do everything on my own. I haven’t had to depend on anyone financially—until now. Support Raising. I don’t think a single missionary enjoys this process. It’s daunting, scary, humbling, and perhaps for some, humiliating. You see, in our American culture, we have been taught not to depend on others for anything, really, except for emotional support. Pull yourself up by your own bootstraps. Make your own way in life. And Frank Sintra’s famous, I did it my way. As Christians, we aren’t called to live life all alone; we are called to live in community; we are called to live not independently, dependently, but interdependently. And truly, that’s how we are designed to live as human beings. Even if I were independently wealthy, I don’t think being a missionary, solely dependent on my own funds, would be the way to go. When we commit to a project, organization, or cause with our time or money, we become engaged and invested. All of sudden that remote well in Haiti becomes my well too. If you feel compelled to partner with me in prayer and/or finances, my work in South Africa becomes our work in South Africa. Both senders and goers are equally important in God’s eyes. As usual, Jesus knew what he was doing when he set up this model for proclaiming the Good News: “Soon afterwards he went on through cities and villages, proclaiming and bringing the good news of the kingdom of God. The twelve were with him, as well as some women who had been cured of evil spirits and infirmities: Mary, called Magdalene, from whom seven demons had gone out, and Joanna, the wife of Herod’s steward Chuza, and Susanna, and many others, who provided for them out of their resources” (Luke 8:1-3, NRSV). A lot of times, I think Jesus’ women disciples get forgotten; but they played an integral role in his ministry by traveling with him and by donating to his cause. If a life of interdependency was good for Jesus and his disciples, it is good enough for me.